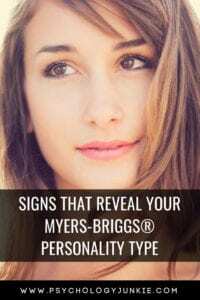 When it comes to finding someone’s personality type, there are a lot of in-depth courses you can take or books you can read that can give you direction. However, as you learn more and more about type you’ll start to pick up on quick and easy “tells” that give away someone’s type. Let’s take a look at what some of those are! ISFJs and ISTJs both speak in a very literal, linear fashion. They refer to the past frequently and are quick to recall useful tips or lessons they’ve learned in the past. They enjoy recalling favorite memories in detail and reminiscing together about shared experiences. They are often quick to point out when someone reminds them of someone else or a situation reminds them of a different situation. Some typologists believe that these two types experience “deja vu” more than any other types! ISFJs use words like “we” a lot. They have an inclusive language because they want people to feel involved and considered. They are usually tactful and warm, remembering their manners and having an innate sense of propriety. They make decisions by considering the personal needs of the people involved. Harmony is very important to them. ISTJs tend to imply “you should” or “you ought to” when they express an opinion. They tend to have a sense of authority about how things should be done. They rarely say “I think” or “I feel”. They make decisions using objective, logical criteria and weighing pros and cons. Efficiency and effectiveness are big priorities for them. Both ISTJs and ISFJs tend to be reserved and private. They don’t like a lot of stimulation, noise, or extraneous activity. They both enjoy traditions, routines, and having an organized schedule. ESFPs and ESTPs are both quick-on-their feet and flexible personality types. They like to adapt to new and changing situations and easily get bored if life is monotonous or slow. These types like to be active and engaged with the world around them as much as possible. They tend to be adventurous, impulsive, and spontaneous. They react very quickly to changes in their environment and can blend into nearly any culture or situation easily. ESPs tend to use a lot of non-verbal communication when they are speaking. Hand gestures, winks, and animated facial expressions keep the conversation moving at a quick and interactive pace. They are usually very quick to pick up on other people’s body language and may mirror others without even realizing they are doing it. Their eyes tend to dart around the room so they can keep track of everything that’s happening around them. They speak in very literal terms, using present-tense language. ESTPs make decisions by focusing on logical consequences and what feels most in line with their principles. They are more direct than ESFPs and hate sugarcoating or beating-around-the-bush. They like to get right to the point and they enjoy troubleshooting and playing devil’s advocate. ESFPs make decisions by focusing on their inner value-system and what feels ethically right to them. They like to keep things real and often appear more authentic and self-revealing than ESTPs do. They empathize easily with people and try to protect other people’s integrity as well as their own. One of the defining characteristics of INFJs and INTJs is how much they want to make everything “new”. They want to find better solutions than whatever currently exists. They hate hearing phrases like, “If it ain’t broke don’t fix it” because they feel like everything can and should be made better. They like to talk about complex subjects and have a hard time staying tuned into small-talk or everyday conversation. INTJs and INFJs use a lot of metaphor, analogy, or theoretical language to describe things. They think about the distant future frequently, and they tend to make surprisingly astute observations and predictions about how things will transpire in the years to come. Both of these personality types tend to be slow to reply – they prefer to have a lot of time to analyze information and take in as many perspectives as they can before making a decision. They get easily over-stimulated if they are in loud, busy, bright environments. INTJs are very direct and logical in their speech. They are good at staying objective when a decision has to be made and when they give an opinion they rarely sugarcoat it. They have a skill for analyzing pros and cons and finding the most expedient, logical solutions. There tends to be a tone of “You should” or “You ought to” in their speech when they give an opinion. INFJs appear very warm and empathetic. They tend to take on the feelings of the people they are with and are quite sensitive to the emotional atmosphere. Because of this they may adapt emotionally to others, appearing sad when others are sad or happy when they are happy. They are usually polite and conscientious. Overall, INTJs and INFJs are known for being stubborn, independent, strategic, and visionary. They often appear preoccupied because their inner thought-processes are often out-of-synch with what’s happening in the real world. They may often be referred to as “daydreamers”. ENFPs and ENTPs are usually good at expressing themselves, especially when they are excited about an idea or vision that they have for the future. They naturally see a plethora of possibilities in the world around them and are eager to communicate potential to the people they are with. When they are talking they tend to speak in a non-linear way, bringing in connections from many different places in time. ENPs are driven by their inspirations. They have to do what compels them, what incites their curiosity and makes them wonder “what if?!”. It is difficult for them to stay focused on repetitive or monotonous tasks that leave no room for innovation, change, or complexity. If they have a lot of mundane work to do they tend to get sidetracked by other more tempting ideas and possibilities. Because of this tendency, they like change for the sake of change. They can easily switch subjects in conversation quickly and cover a lot of ground in a rapid amount of time. ENTPs weigh pros and cons and look for accuracy when they make decisions. They are quick to point out logical disparities and they can’t abide generalizations. They are very careful with their word choice to make sure that they are describing their viewpoint as accurately as possible. They will use the words “I think” quite frequently. ENFPs weigh their values when they make a decision. They want to maintain authenticity and inner harmony by doing what they believe is right for themselves. They also care about the emotional integrity of others and will do what they can to uphold and protect that. They will use words like “I feel” a lot when they describe things. Both types are spontaneous, adaptable, and inspired by change. They like to teach people new ways of looking at everything. ESFJs and ENFJs both focus a lot on relationships and people. They have a natural focus on other people’s needs and desires and are usually warm and accommodating. They like to boost morale and keep the mood elevated. They feel other people’s pain, embarrassment, or joy deeply and so they dislike being in environments that are rife with tension or conflict. ESFJs and ENFJs use “we” or “let’s” frequently in their speech. They also use phrases like “let’s talk it over”, or “we can work it out”. They want to make sure everyone’s needs are addressed and that no one is feeling left out or excluded. They are usually tactful and polite. They are good at organizing their environment to get needs met or to reach a goal. ESFJs will reference the past in their speech. They might say “this reminds me of”, or “this is just like that other time” a lot. They tend to quickly recognize actors in television shows and movies or the names of people they’ve met before. They are good at remembering social occasions and commemorating them for people. ENFJs are less able to reference the past, but more focused on envisioning where things will go in the future. They are more likely to forget names and faces, but they will remember hunches they got about people or psychological details. They are more likely to talk about what “could be” or “will be” rather than what has already occurred. ENTJs and ESTJs appear very direct, organized, and in control. They want to get things done and cross items off their checklists – in fact, they usually have a checklist nearby to make sure they’re staying on track. They are decisive and hate procrastinating or dilly-dallying about anything – forward movement in all of their goals or projects is important to them and they tend to be hard-workers. When ENTJs and ESTJs express an opinion, there tends to be a tone of “you should” or “you ought to” in what they are saying. They also tend to preface everything they say by giving an overview first. For example, “We need to cut down on budget costs. Here’s an overview of how we can get started.” They tend to have a “if this, then that” approach to life. Everything they do seems to be a result of many yes/no decisions. ESTJs speak in a very linear way and they recall a lot of details from their past. They easily remember lessons from the past that they will try to employ again and again in the present or future. They tend to use very concrete, literal language and they dislike “beating around the bush”. They enjoy traditions and they thrive on having a very consistent routine. ENTJs speak in a more roundabout way. If they have a point to make they’ll start by giving the big picture and filling in with details later. They will project more into the future and can get very bored talking about the past. They like having a structure, but tend to get bored if their routine is too repetitive or unchanging. Both ESTJs and ENTJs like to have things organized and streamlined in their outer world. They create structures, systems, and rules for things so that life goes smoothly and everyone knows their part. INTPs and ISTPs appear reserved, analytical, and independent. They tend to have a “poker face” because they often hide stress and emotional responses in favor of analyzing things logically. When they speak they say “I think” a lot and will say “my” rather than “our” when it comes to decisions they are making. They don’t feel comfortable imposing their agenda on other people although they do try to be persuasive about their logic and conclusions. They have a tendency to play “devil’s advocate” very well. It’s easy for them to see many competing sides to a situation or argument. In communication INTPs and ISTPs are very precise and concise. They want to use the most accurate words possible to defend their position or explain where they are coming from. Sometimes they will give a lot of detail just so that they are conveying their thoughts as accurately as possible. They dislike generalizations or being hurried to make a decision or explain themselves. When others are speaking to them, they have a habit of re-framing the statement back to them to make sure they got it right. Sometimes this appears as challenging or argumentative to other people, but they are really just trying to make sure they understood precisely what the other person was trying to say. INTPs tend to use more metaphor, analogy, and roundabout methods to get their point across. They are less linear and sequential in their speech than ISTPs are. They also tend to focus on the present, past, and future in random order – seeing connections between every place in time. They enjoy imagining, brainstorming, envisioning, and finding unusual connections and relationships. ISTPs tend to be more literal and sequential in their speech patterns. They are more observant of the details around them and tuned into the moment they are living in. They are usually more action-oriented than INTPs are. While INTPs toy more with theories and abstractions, ISTPs toy more with mechanics and concrete objects. Both INTPs and ISTPs see truth and fairness as guiding principles. They may not appear emotionally expressive or warm, but they care about making sure everyone has their personal freedoms respected. They are self-competitive, innovative, and inwardly organized. INFPs and ISFPs tend to appear easy-going, accepting, and empathetic. They are usually flexible and tolerant unless one of their values is challenged or violated. They can become very tense, cold, and withdrawn if someone is saying something that feels wrong to them. They are good at taking care of people one-on-one, but in group settings they can be very reserved and keep to themselves if they don’t know anyone. Both ISFPs and INFPs “mirror” the emotions of other people. They easily put themselves in other people’s shoes which allows them to identify with the hurts and longings of others. Above all, being honest and authentic is vitally important to IFP personality types. They believe in living in accordance with their values and desires and are dead set against phoniness, manipulation, or meddling. It can actually be difficult to tell what they are feeling from the outside – they have a skill for appearing neutral and calm even if they are experiencing a whirlwind of emotions internally. ISFPs pair their feeling preference with an intense, realistic nature. They are extremely down-to-earth and aware of their surroundings, especially as they reach their 20’s and beyond. They like to channel their values and beliefs into their actions – whether it’s through creative work or helping people in practical, immediate ways. They tend to be quietly observant and aware of what’s happening around them. INFPs pair their feeling preference with an imaginative outlook on life. They like to see theoretical connections between things and they tend to enjoy fantasizing and creating. They use a lot more metaphor and analogy in their speech than ISFPs do, and they are more focused on the future than the present moment. Let us know if you have any observations or tips in the comments! What if I have some of all personality traits? Then you probably havent learned functions well enough to differentiate your type and also probably are a 9 or 4 enneagram which tends to identify with a little bit of everything.